Simple, frugal lentils are the base of this hearty lentil stew that will leave you happily satisfied. Not only because it tastes great, but because it delivers a healthy dose of solid nutrition. 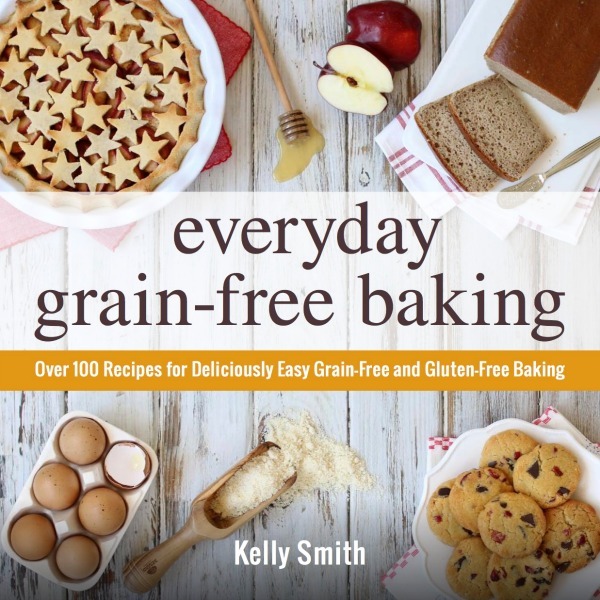 Since going gluten-free/grain-free, I’ve been following the specific carbohydrate diet for the most part (a special gluten-free, grain-free diet for those with chronic conditions, such as celiac, crohn’s, ulcerative colitis, etc.). Happily, lentils are on the “legal” list and for good reason – they are an inexpensive powerhouse of nutrition. When properly prepared through soaking, lentils are an excellent source of B vitamins and minerals like iron, phosphorus, potassium and zinc. And, pairing them with homemade bone broth provides even more nutritional support, as well as greatly enhances their flavor. Eating food this delicious, nutritious and heart warming brings a smile to my face, and my family’s too – that’s the best part of all! In the morning on the day you plan to make this stew, place lentils in a large bowl, cover with warm water and stir in vinegar. Cover the bowl with a kitchen towel, and leave it on your countertop for 8-12 hours. Then, drain the lentils and rinse them well. Set aside. In a Dutch oven (or large stockpot) heat one tablespoon of olive oil over medium-high heat. Add the diced sausage (or ground sausage meat) and cook until browned (about 6-8 minutes). Add the onions and cook, stirring occasionally, until they begin to soften (about 4-5 minutes). Then, add the garlic and cook until fragrant (about 1 minute). Add the soaked and drained lentils, chicken stock and seasonings. Bring to a simmer and cook uncovered for 10 minutes, stirring occasionally. Next, add the diced sweet potatoes. 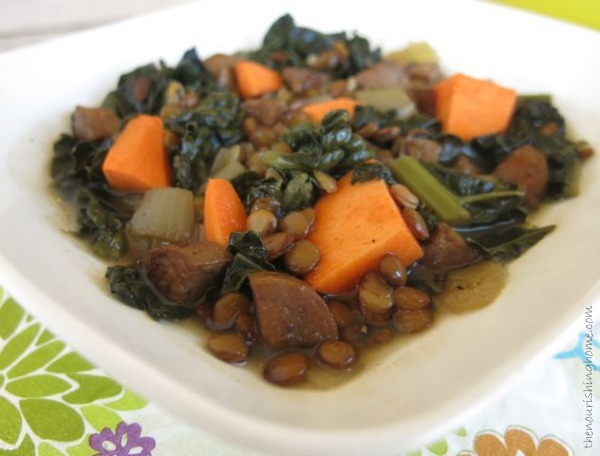 Bring stew back to a gentle simmer and cook an additional 15-20 minutes until the lentils and sweet potatoes reach desired tenderness. Then, turn off the heat, and stir in the kale. Cover and allow the kale to wilt in the hot stew about 5 minutes. Ladle into bowls and enjoy with a side of hot buttered rolls. This dish definitely warms the heart and tummy! Enjoy! Recipe Variation: Love bacon? Create a whole new flavor profile by substituting the sausage with 4-5 slices of nitrate-free bacon. Simply dice the bacon and sauté in your Dutch oven or stockpot. Then follow the rest of the recipe instructions as outlined above. P.S. You can also substitute carrots for the sweet potatoes. And substitute the kale with any favorite green, such as collard, mustard or Swiss chard. Any suggestions for making this in a crock pot? Kelly…I made this right after you posted it, and it was a hit in our home. It will be a great main course to take to people when I do meals for them. Thanks for your great ideas! 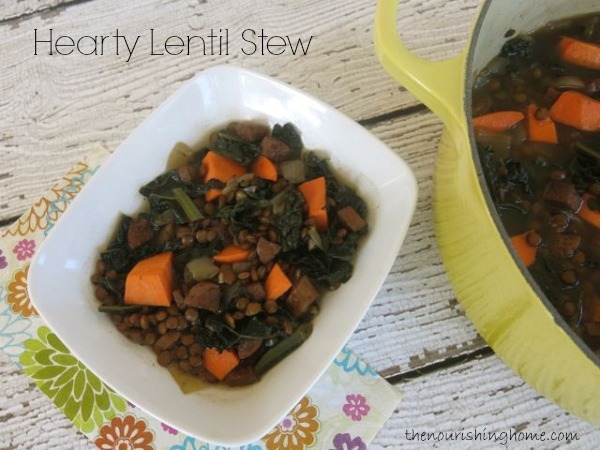 This was my first recipe using lentils. My family and I absolutely loved this! Thank you for sharing this recipe. I’m fairly new to the world of real food, but your blog has been so helpful and encouraging. Thank you for sharing your knowledge and heart. Such an awesome recipe! I made it tonight for my family and we all loved it!!! It was perfect! I can’t wait to eat leftovers tomorrow! Thank you for the recipe. I made it tonight and we really enjoyed it. We have tried many of your recipes and they all turn out excellent. My favorite go to site for recipes. So thanks.